Sequestration and public perceptions of US foreign aid: An ill-fated combination? Cutting programs that serve people who are poor will never help us close the budget gap. Mary Marchal is Partnerships Advisor on Oxfam America’s Aid Effectiveness Team. As sequestration looms, I can’t help but think—what do Americans and policymakers imagine when they think of developing countries and our assistance to them? Do massive federal budget cuts have human faces associated with them? 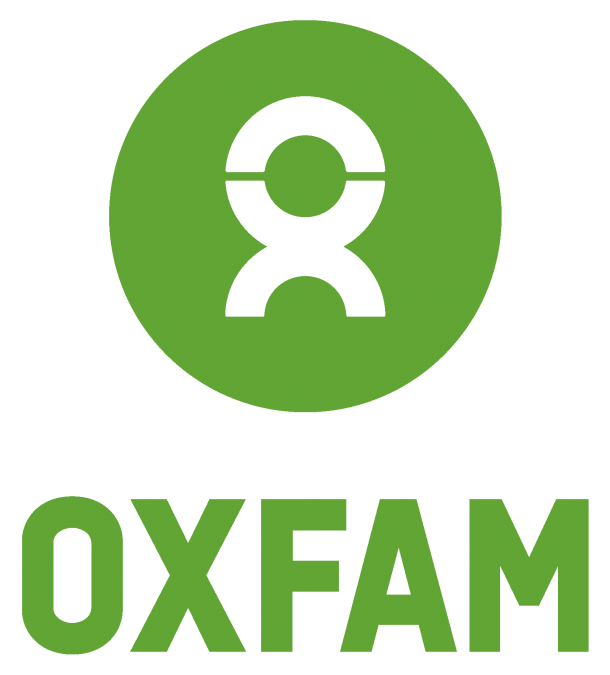 At Oxfam, many of the people we work with and talk about—and who will be directly affected by cuts to poverty-reducing aid—are ordinary people doing extraordinary things. 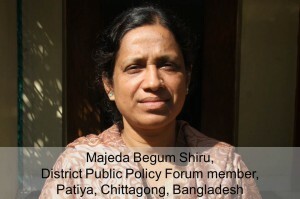 Majeda Begum Shiru comes to mind—a woman who rarely even used to go into government offices where she lives in southeastern Bangladesh. “Even if I did, I felt uncomfortable,” she says. After being trained in public speaking and leadership (provided by NGO Bangladesh Nari Progati Sangha with support from USAID), Shiru was elected as a member of the District Public Policy forum. Today, she has become one of the locally-elected officials she used to fear. It is people like these who drive our work on Oxfam America’s aid effectiveness team and why we continue to advocate for better aid, despite a difficult budget climate and now looming sequestration. Evidence tells us that US development aid works when resources are put directly into the hands of those people like Shiru, who are working every day to improve their communities. The Pew Research Center last week released a new national survey on potential cuts in US government spending. For 18 of 19 programs tested, majorities want either to increase spending or maintain it at current levels. Unfortunately, the only exception was assistance for people who are poor in the developing world. At less than 1% of the US federal budget, eliminating humanitarian and development aid won’t help us cover the budget gap. Cutting programs that serve people who are poor in the US won’t help either. It’s an argument we’ve made at Oxfam (and will continue to make) again and again. So how do we give policymakers and the American public a chance to see foreign aid the way we see it? How can poverty-reducing foreign aid be associated with people like Majeda Begum Shiru, rather than nameless or voiceless people who receive a bednet or a bag of seeds? 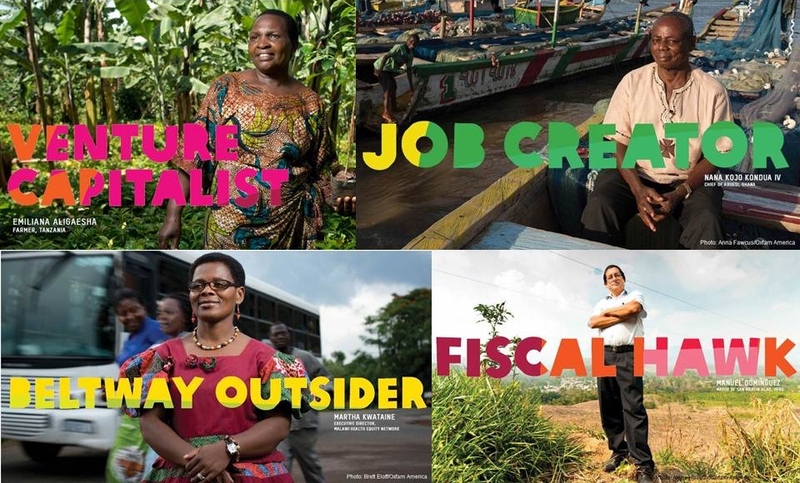 In January, Oxfam America created a series of ads featuring stories of local “changemakers” who are holding their governments accountable, seeing results, and using US foreign assistance to get it done. Twenty-eight billboards in metro stations and at Washington DC’s National and Dulles airports were accompanied by print and online ads, op-eds, interviews, articles, and blog posts. The ads superimposed DC-insider buzzwords such as “job creator” and “beltway outsider” with decidedly non-DC imagery—people surrounded by fishing boats in Ghana, a plant nursery in Tanzania, a roadway in Malawi. However, we don’t yet know what will affect the US general public’s view of foreign aid. On the first day the ads hit, the New Media team reported that the first blog post was being shared more than average. Even though the campaign was focused on DC policymakers, this led us to invest in some sponsored Facebook ads with friends of Oxfam’s friends. Many people’s reactions were overtly negative however, and we feared this would overshadow the critical message. Clearly very few US citizens realize that less than 1% of the US federal budget goes to poverty-focused international aid. Oxfam America’s publication, Foreign Aid 101, and this campaign from ONE start the conversation, but there is a long way to go. Regardless of what happens in Congress in coming weeks, we will continue to fight to make aid more useful to those leading change in their own countries. And we will continue to ask people like Majeda Begum Shiru, Emiliana Aligaesha, Manuel Dominguez, Martha Kwataine, and Nana Kojo Kondua IV to show us how. I’m very happy to uncover this site. I wanted to thank you for your time for this particularly wonderful read!! It’s going to be ending of mine day, however before finish I am reading this wonderful piece of writing to improve my experience. The Foreign Aid Transparency and Accountability Act, Take 2!